Note: This presentation is based on theories of Robert K. Merton. 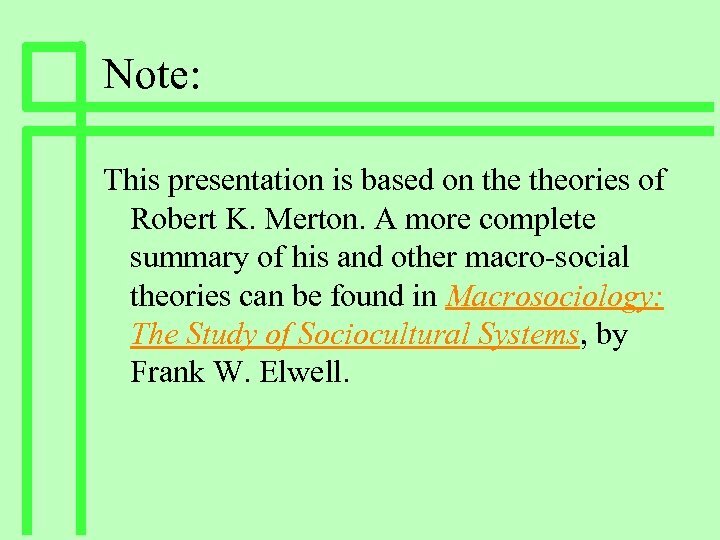 A more complete summary of his and other macro-social theories can be found in Macrosociology: The Study of Sociocultural Systems, by Frank W. Elwell. 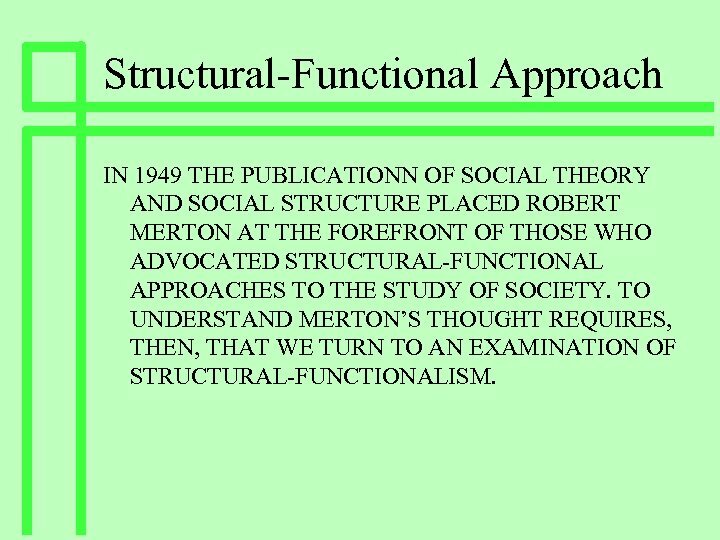 Structural-Functional Approach IN 1949 THE PUBLICATIONN OF SOCIAL THEORY AND SOCIAL STRUCTURE PLACED ROBERT MERTON AT THE FOREFRONT OF THOSE WHO ADVOCATED STRUCTURAL-FUNCTIONAL APPROACHES TO THE STUDY OF SOCIETY. TO UNDERSTAND MERTON’S THOUGHT REQUIRES, THEN, THAT WE TURN TO AN EXAMINATION OF STRUCTURAL-FUNCTIONALISM. 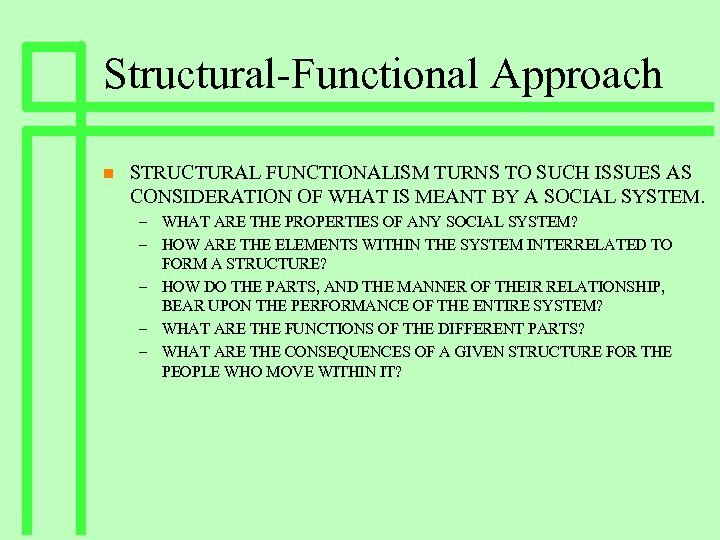 Structural-Functional Approach n STRUCTURAL FUNCTIONALISM TURNS TO SUCH ISSUES AS CONSIDERATION OF WHAT IS MEANT BY A SOCIAL SYSTEM. 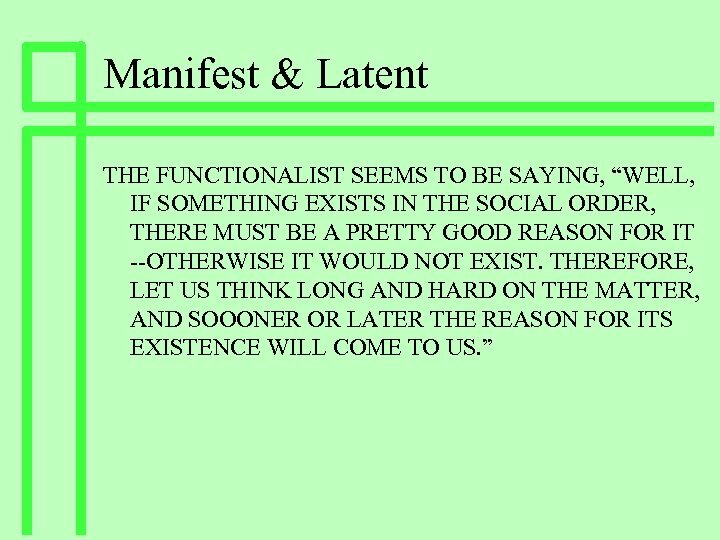 – WHAT ARE THE PROPERTIES OF ANY SOCIAL SYSTEM? – HOW ARE THE ELEMENTS WITHIN THE SYSTEM INTERRELATED TO FORM A STRUCTURE? – HOW DO THE PARTS, AND THE MANNER OF THEIR RELATIONSHIP, BEAR UPON THE PERFORMANCE OF THE ENTIRE SYSTEM? – WHAT ARE THE FUNCTIONS OF THE DIFFERENT PARTS? – WHAT ARE THE CONSEQUENCES OF A GIVEN STRUCTURE FOR THE PEOPLE WHO MOVE WITHIN IT? 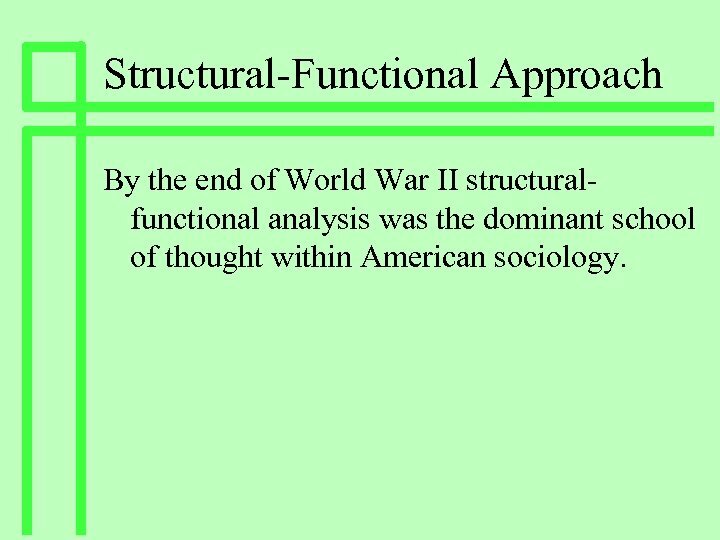 Structural-Functional Approach By the end of World War II structuralfunctional analysis was the dominant school of thought within American sociology. 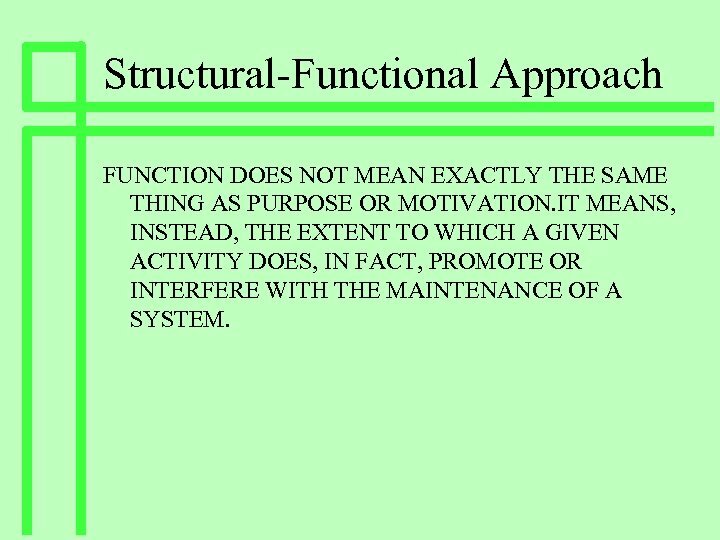 Structural-Functional Approach FUNCTION DOES NOT MEAN EXACTLY THE SAME THING AS PURPOSE OR MOTIVATION. 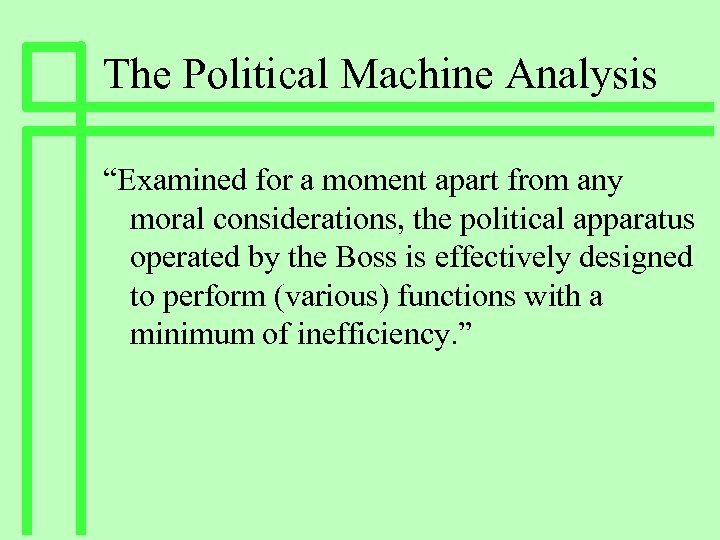 IT MEANS, INSTEAD, THE EXTENT TO WHICH A GIVEN ACTIVITY DOES, IN FACT, PROMOTE OR INTERFERE WITH THE MAINTENANCE OF A SYSTEM. 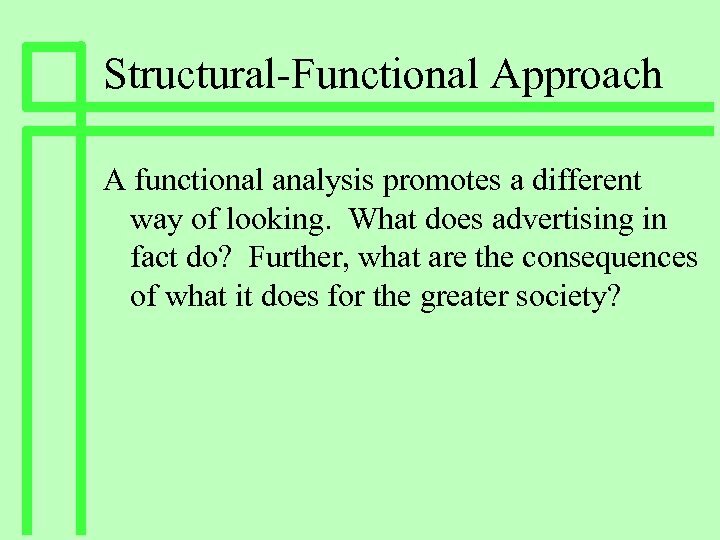 Structural-Functional Approach A functional analysis promotes a different way of looking. What does advertising in fact do? Further, what are the consequences of what it does for the greater society? 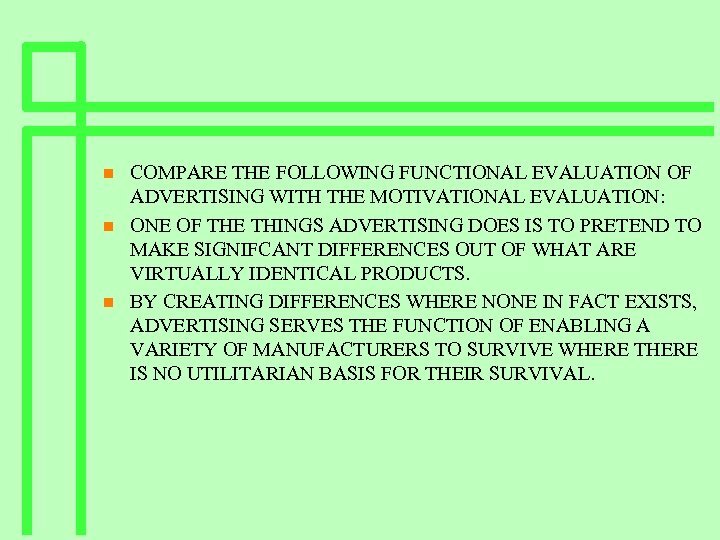 n n n COMPARE THE FOLLOWING FUNCTIONAL EVALUATION OF ADVERTISING WITH THE MOTIVATIONAL EVALUATION: ONE OF THE THINGS ADVERTISING DOES IS TO PRETEND TO MAKE SIGNIFCANT DIFFERENCES OUT OF WHAT ARE VIRTUALLY IDENTICAL PRODUCTS. BY CREATING DIFFERENCES WHERE NONE IN FACT EXISTS, ADVERTISING SERVES THE FUNCTION OF ENABLING A VARIETY OF MANUFACTURERS TO SURVIVE WHERE THERE IS NO UTILITARIAN BASIS FOR THEIR SURVIVAL. 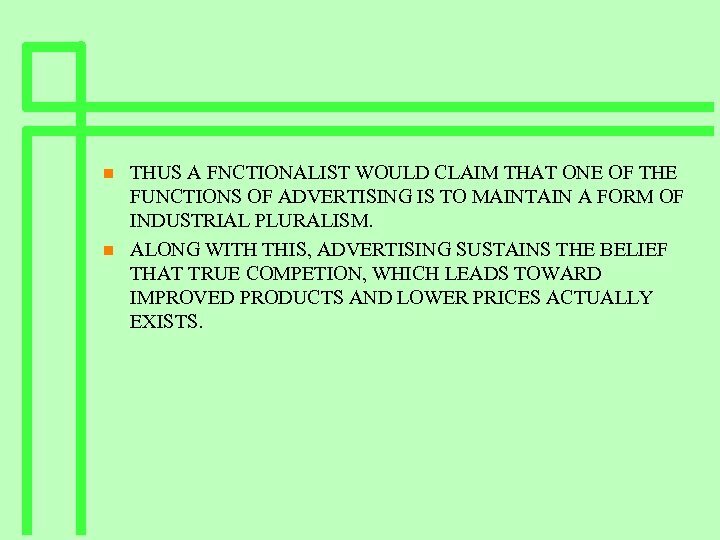 n n THUS A FNCTIONALIST WOULD CLAIM THAT ONE OF THE FUNCTIONS OF ADVERTISING IS TO MAINTAIN A FORM OF INDUSTRIAL PLURALISM. ALONG WITH THIS, ADVERTISING SUSTAINS THE BELIEF THAT TRUE COMPETION, WHICH LEADS TOWARD IMPROVED PRODUCTS AND LOWER PRICES ACTUALLY EXISTS. 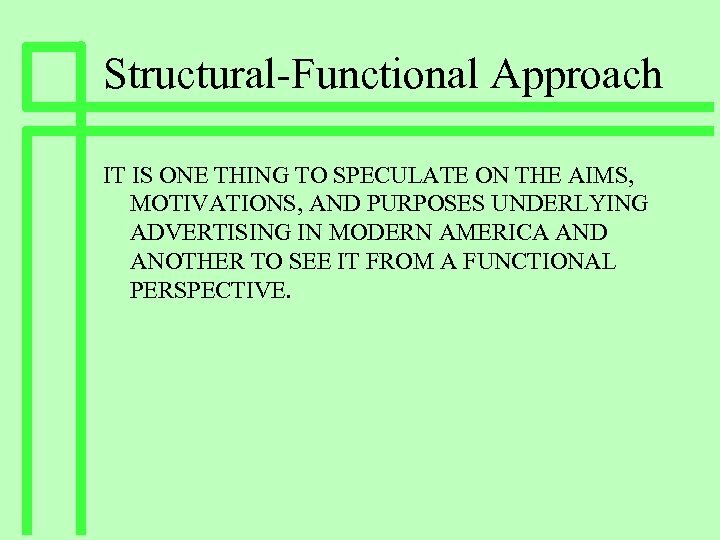 Structural-Functional Approach IT IS ONE THING TO SPECULATE ON THE AIMS, MOTIVATIONS, AND PURPOSES UNDERLYING ADVERTISING IN MODERN AMERICA AND ANOTHER TO SEE IT FROM A FUNCTIONAL PERSPECTIVE. 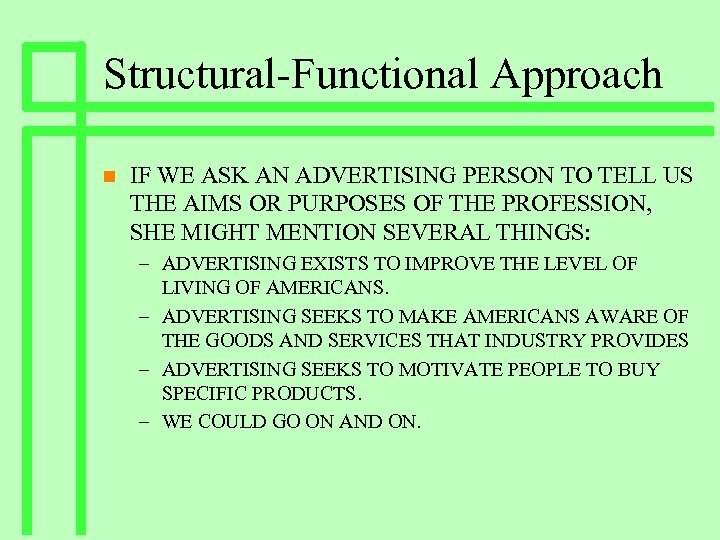 Structural-Functional Approach n IF WE ASK AN ADVERTISING PERSON TO TELL US THE AIMS OR PURPOSES OF THE PROFESSION, SHE MIGHT MENTION SEVERAL THINGS: – ADVERTISING EXISTS TO IMPROVE THE LEVEL OF LIVING OF AMERICANS. – ADVERTISING SEEKS TO MAKE AMERICANS AWARE OF THE GOODS AND SERVICES THAT INDUSTRY PROVIDES – ADVERTISING SEEKS TO MOTIVATE PEOPLE TO BUY SPECIFIC PRODUCTS. – WE COULD GO ON AND ON. 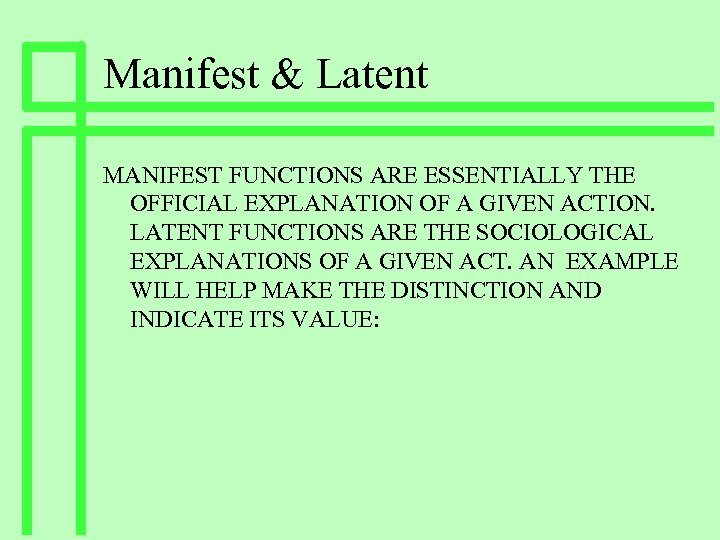 Manifest & Latent n n MANIFEST FUNCTION ARE OBJECTIVE CONSEQUENCES FOR SOME PERSON, SUBGROUP, OR SOCIO-CULTURAL SYSTEM WHICH CONTRIBUTE TO ITS ADJUSTMENT AND WERE SO INTENDED. 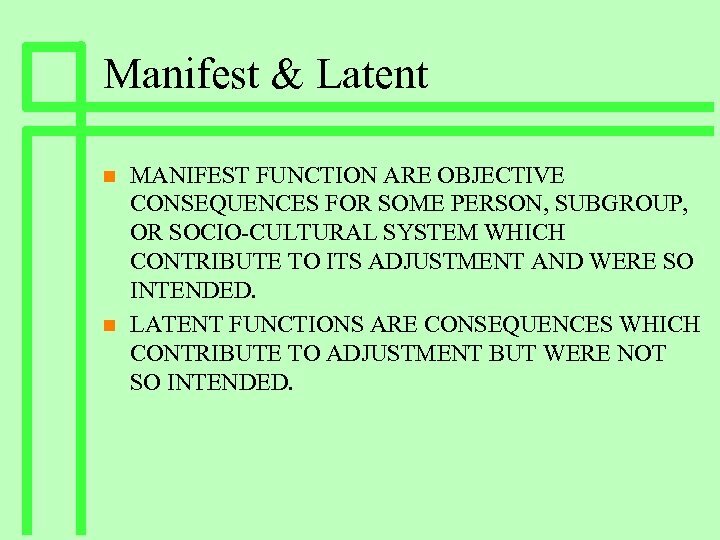 LATENT FUNCTIONS ARE CONSEQUENCES WHICH CONTRIBUTE TO ADJUSTMENT BUT WERE NOT SO INTENDED. 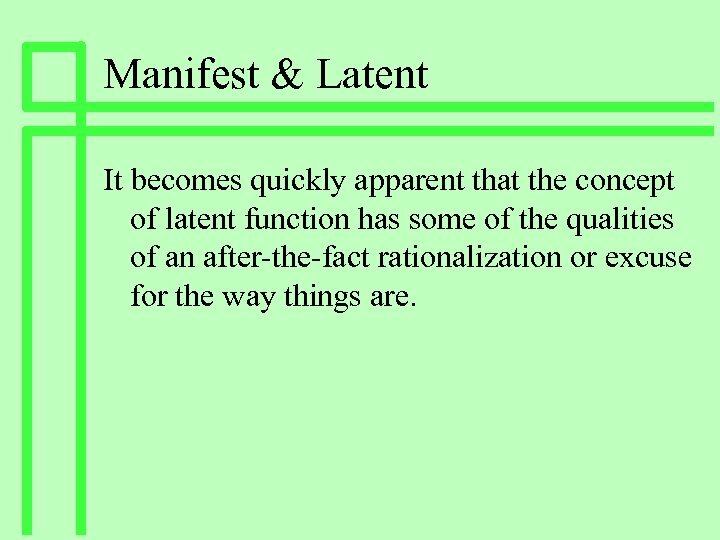 Manifest & Latent It becomes quickly apparent that the concept of latent function has some of the qualities of an after-the-fact rationalization or excuse for the way things are. 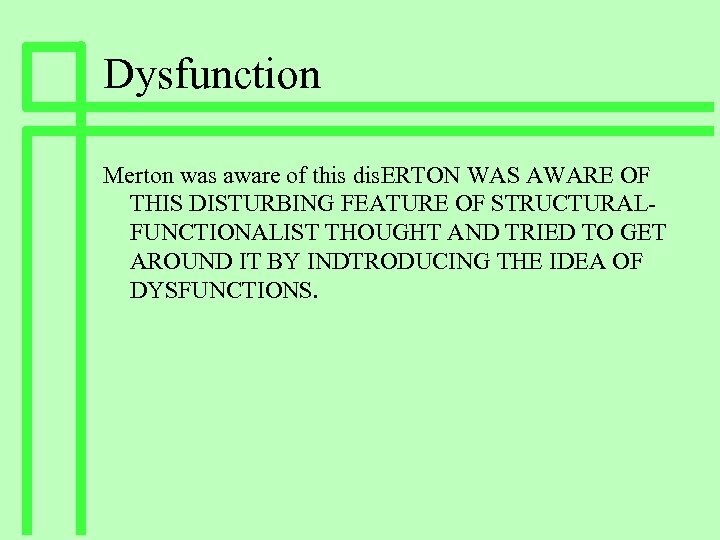 Dysfunction Merton was aware of this dis. 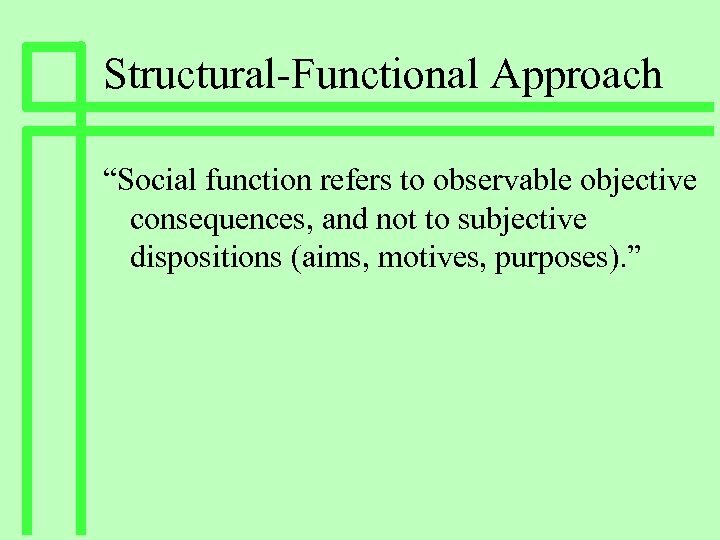 ERTON WAS AWARE OF THIS DISTURBING FEATURE OF STRUCTURALFUNCTIONALIST THOUGHT AND TRIED TO GET AROUND IT BY INDTRODUCING THE IDEA OF DYSFUNCTIONS. 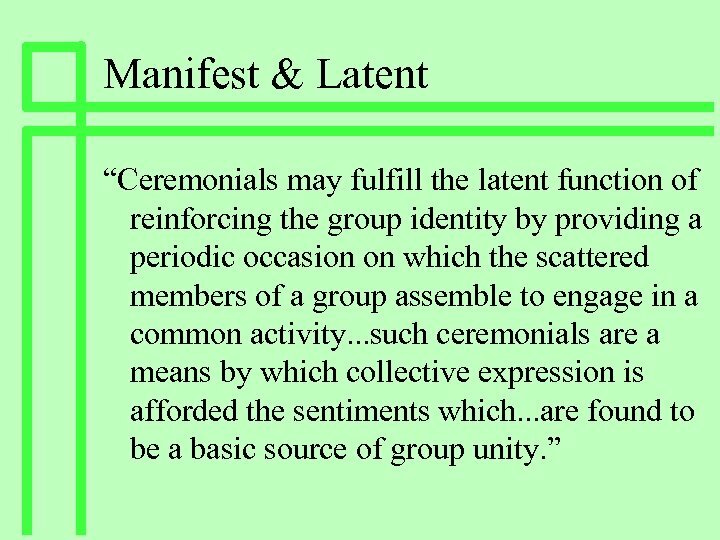 Dysfunctional events lessen the adjustment of a social system. 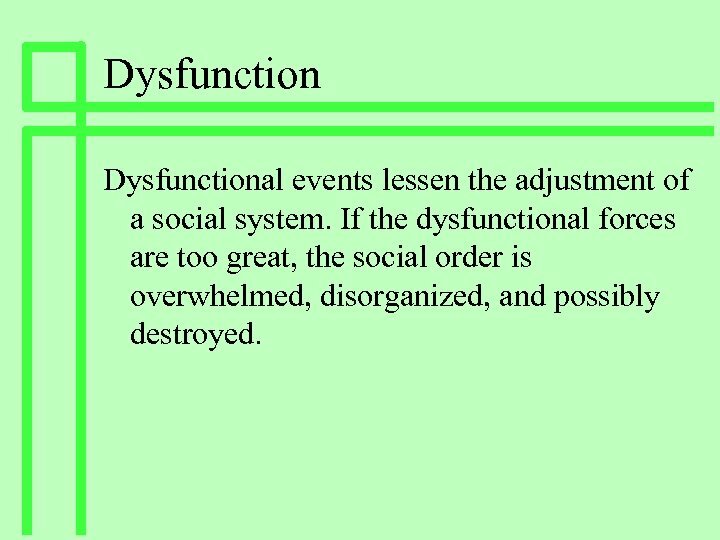 If the dysfunctional forces are too great, the social order is overwhelmed, disorganized, and possibly destroyed. 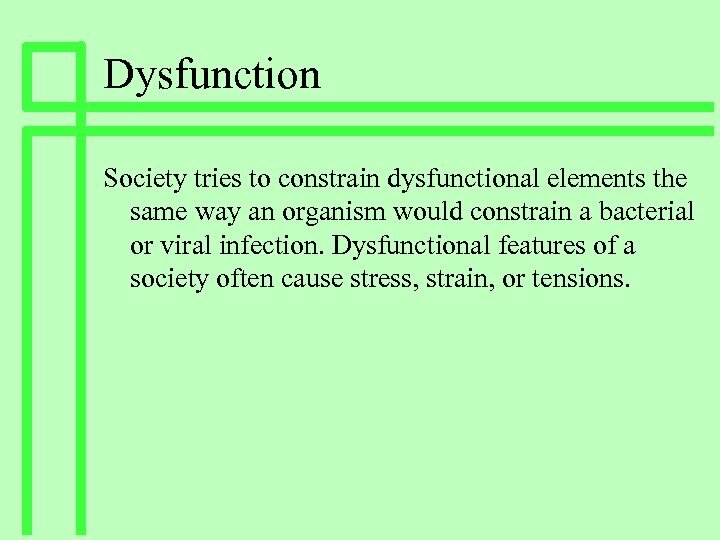 Dysfunction Society tries to constrain dysfunctional elements the same way an organism would constrain a bacterial or viral infection. Dysfunctional features of a society often cause stress, strain, or tensions. 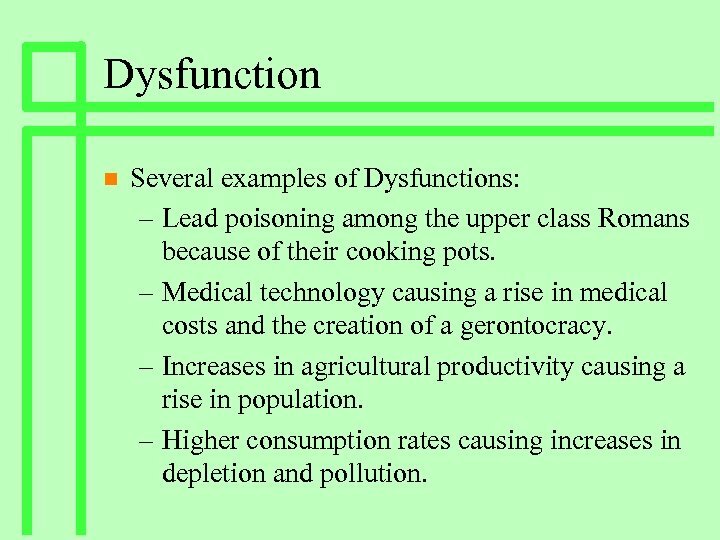 Dysfunction n Several examples of Dysfunctions: – Lead poisoning among the upper class Romans because of their cooking pots. – Medical technology causing a rise in medical costs and the creation of a gerontocracy. – Increases in agricultural productivity causing a rise in population. – Higher consumption rates causing increases in depletion and pollution. 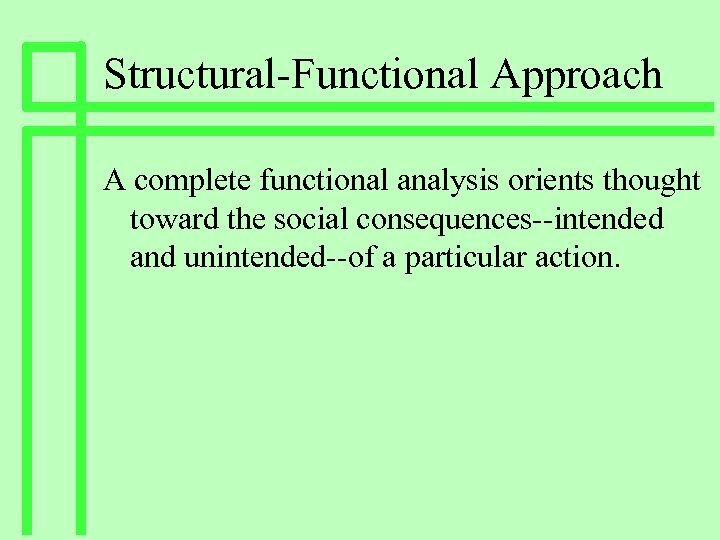 Structural-Functional Approach A complete functional analysis orients thought toward the social consequences--intended and unintended--of a particular action. 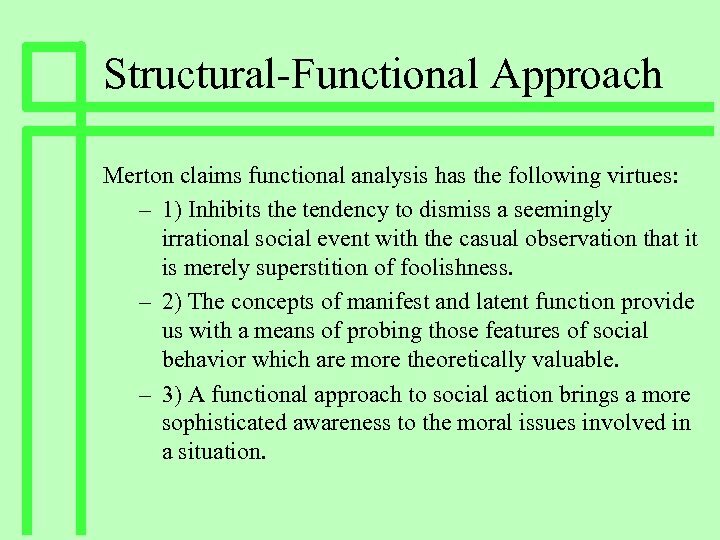 Structural-Functional Approach Merton claims functional analysis has the following virtues: – 1) Inhibits the tendency to dismiss a seemingly irrational social event with the casual observation that it is merely superstition of foolishness. 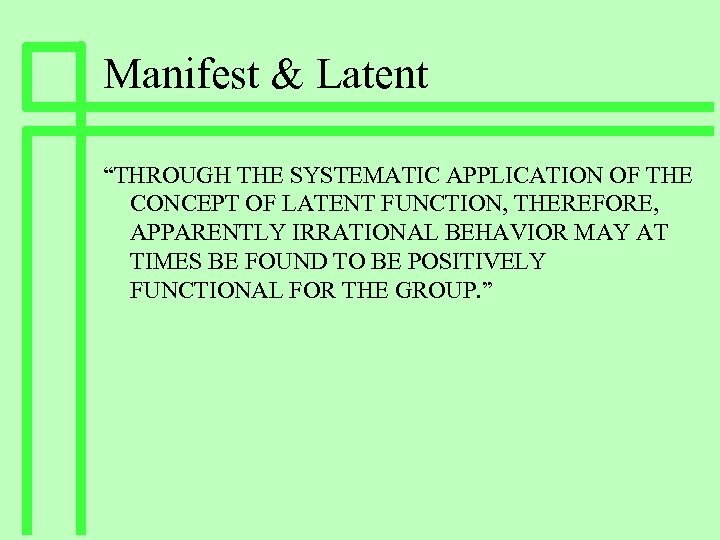 – 2) The concepts of manifest and latent function provide us with a means of probing those features of social behavior which are more theoretically valuable. – 3) A functional approach to social action brings a more sophisticated awareness to the moral issues involved in a situation. 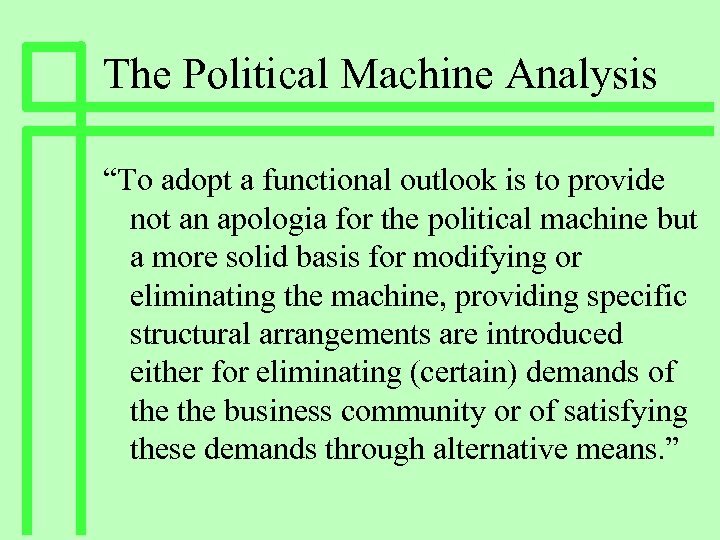 The Political Machine Analysis If we wish, then, to operate either as a relatively detached social analyst or as a social activist, a structural functional point of view is a necessity. 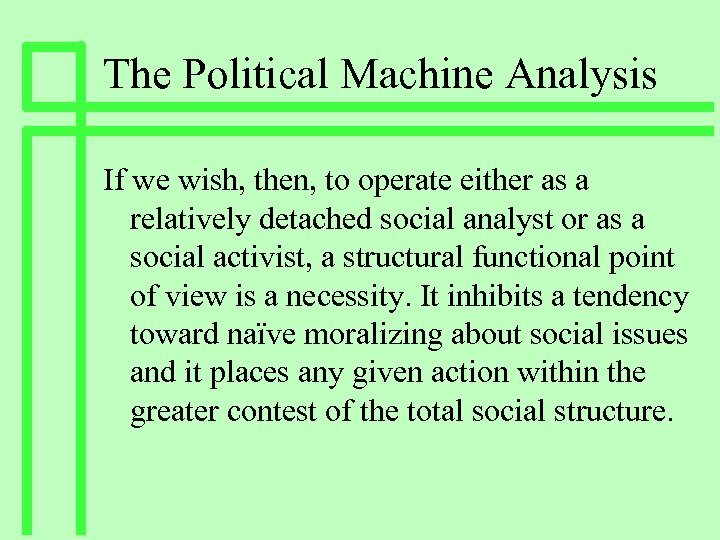 It inhibits a tendency toward naïve moralizing about social issues and it places any given action within the greater contest of the total social structure. 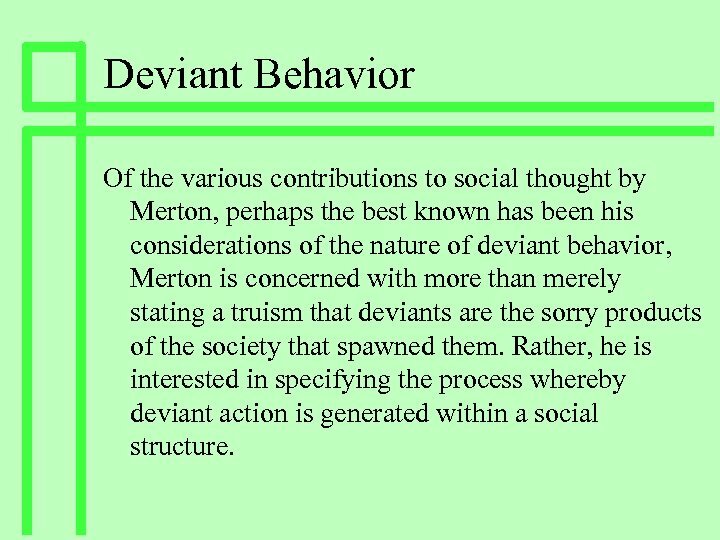 Deviant Behavior Of the various contributions to social thought by Merton, perhaps the best known has been his considerations of the nature of deviant behavior, Merton is concerned with more than merely stating a truism that deviants are the sorry products of the society that spawned them. Rather, he is interested in specifying the process whereby deviant action is generated within a social structure. 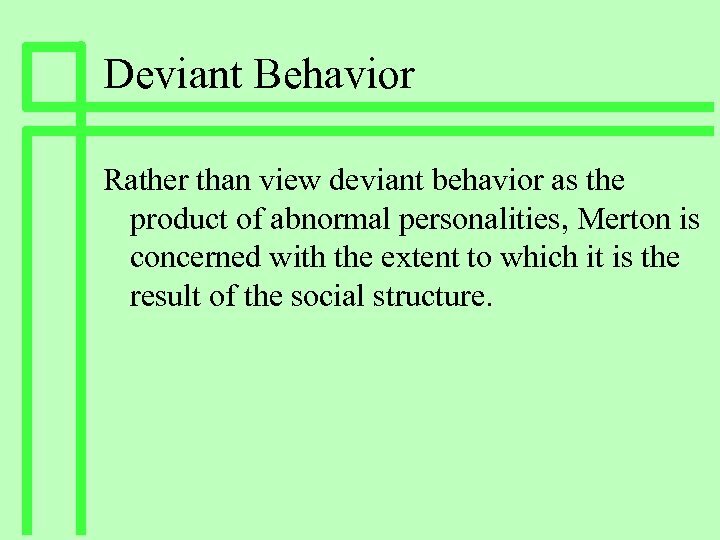 Deviant Behavior Rather than view deviant behavior as the product of abnormal personalities, Merton is concerned with the extent to which it is the result of the social structure. 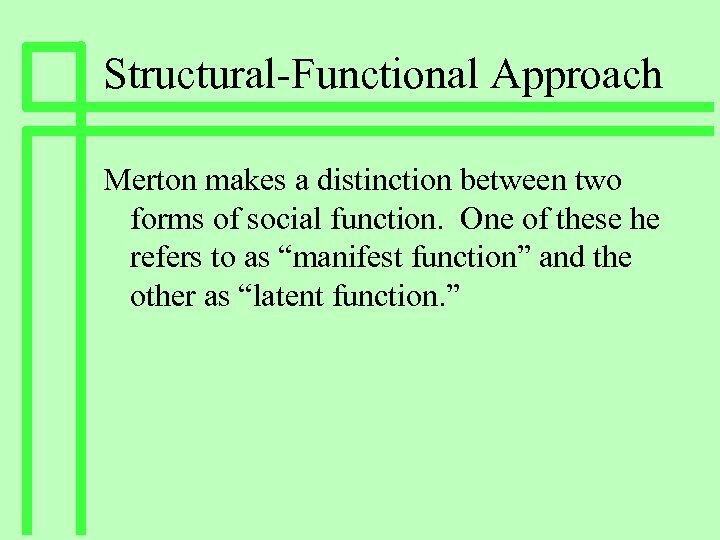 Deviant Behavior In his approach to this problem Merton strips social structure down to two elemental conditions that hold for any society. He makes a distinction between the goals of a culture and the means the culture provides for achieving those goals. 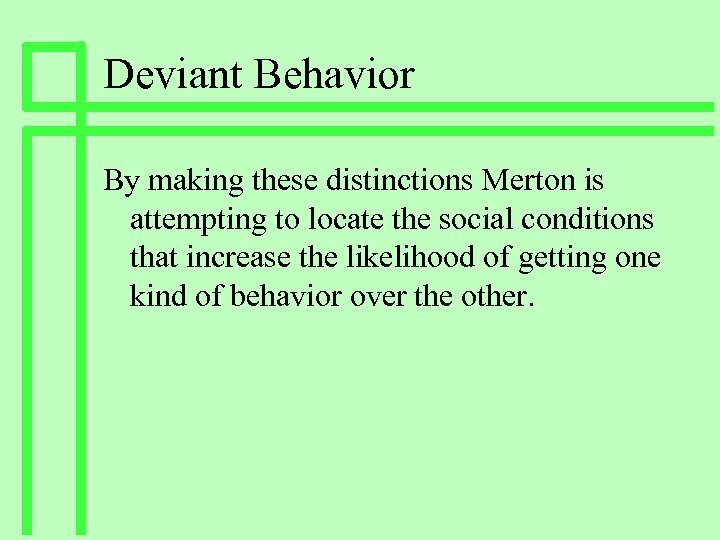 Deviant Behavior By making these distinctions Merton is attempting to locate the social conditions that increase the likelihood of getting one kind of behavior over the other. Deviant Behavior American culture, for example, places great emphasis on the value of individual attainment of success. 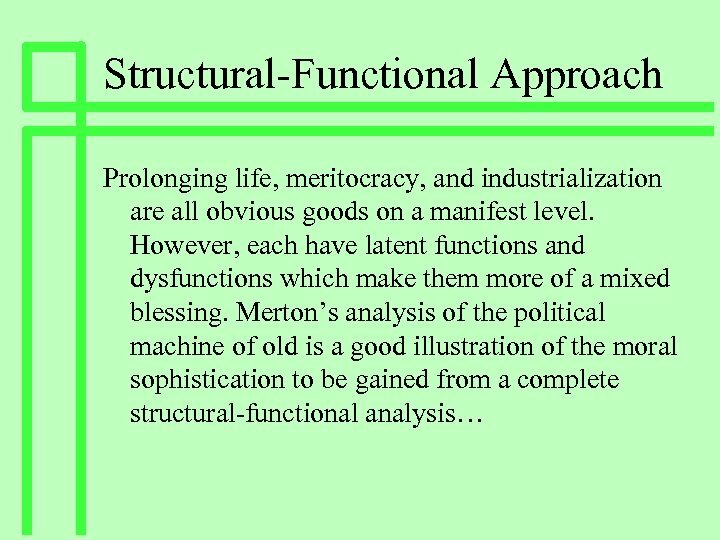 At the same time, the means of achieving success are unevenly distributed among the population, Merton is concerned here with the problem of how people adapt to society and the ways in which the structural feature of society affect the form which adaptations take. 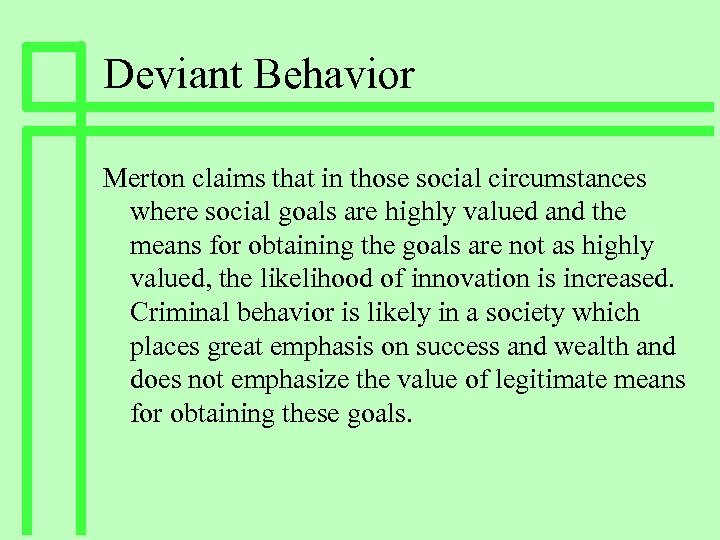 Deviant Behavior Merton claims that in those social circumstances where social goals are highly valued and the means for obtaining the goals are not as highly valued, the likelihood of innovation is increased. Criminal behavior is likely in a society which places great emphasis on success and wealth and does not emphasize the value of legitimate means for obtaining these goals. 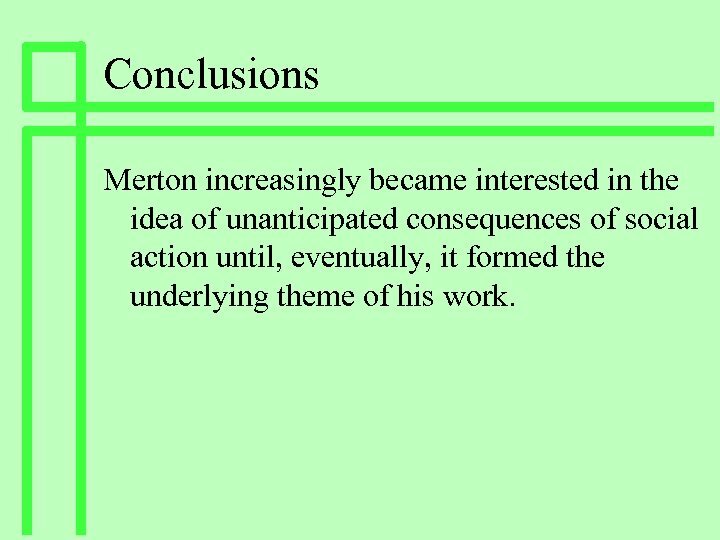 Conclusions Merton increasingly became interested in the idea of unanticipated consequences of social action until, eventually, it formed the underlying theme of his work. 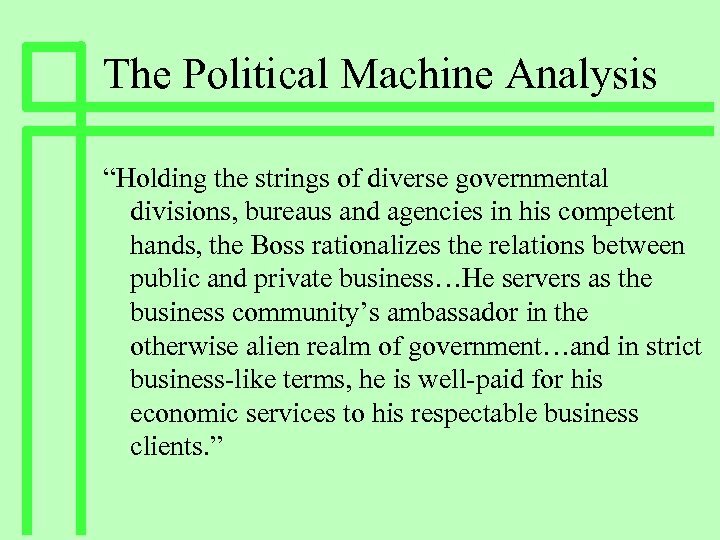 Conclusions n n n From the rise of mass media and the consequent need for vast sums to run political campaigns, comes a lobbying system that has bought and paid for our political representatives. 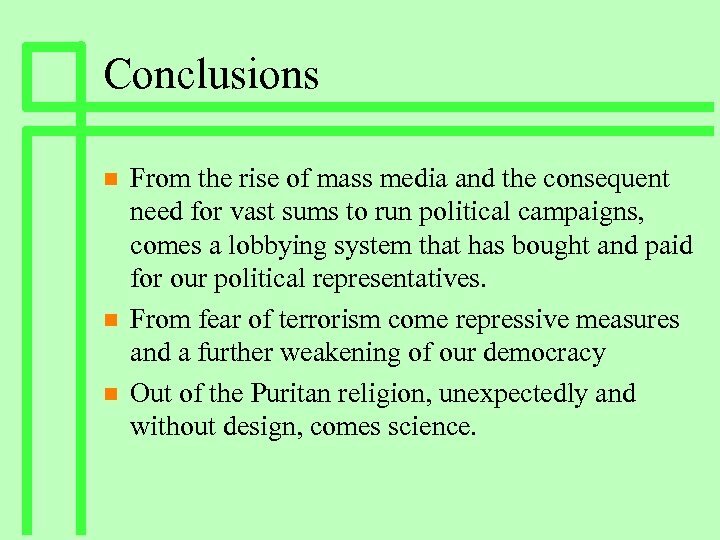 From fear of terrorism come repressive measures and a further weakening of our democracy Out of the Puritan religion, unexpectedly and without design, comes science. 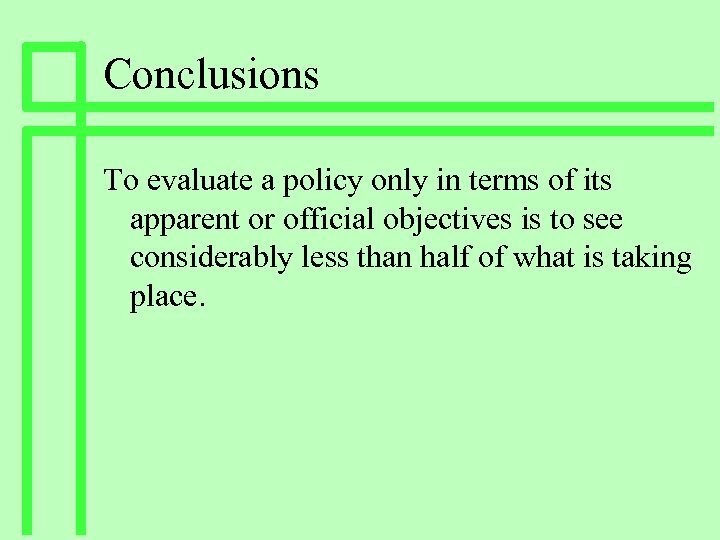 Conclusions To evaluate a policy only in terms of its apparent or official objectives is to see considerably less than half of what is taking place. 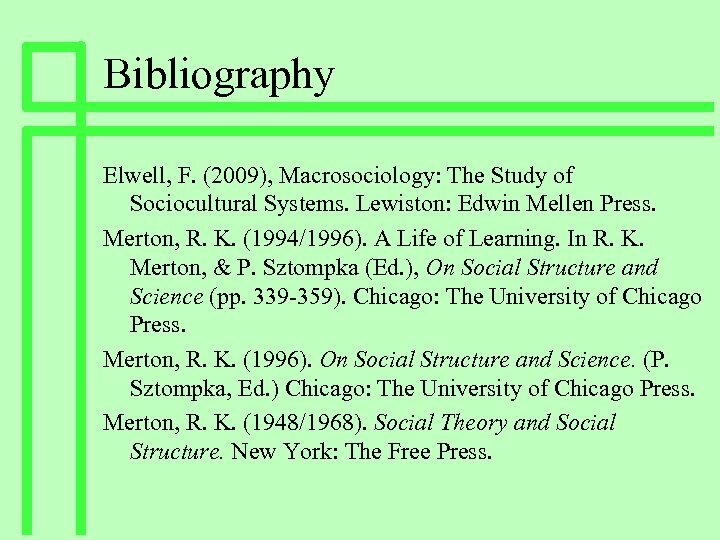 Bibliography Elwell, F. (2009), Macrosociology: The Study of Sociocultural Systems. Lewiston: Edwin Mellen Press. Merton, R. K. (1994/1996). A Life of Learning. 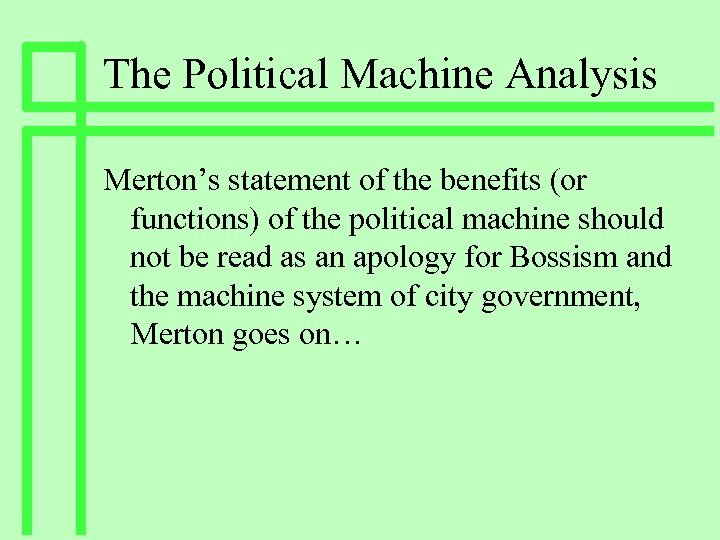 In R. K. Merton, & P. Sztompka (Ed. ), On Social Structure and Science (pp. 339 -359). Chicago: The University of Chicago Press. 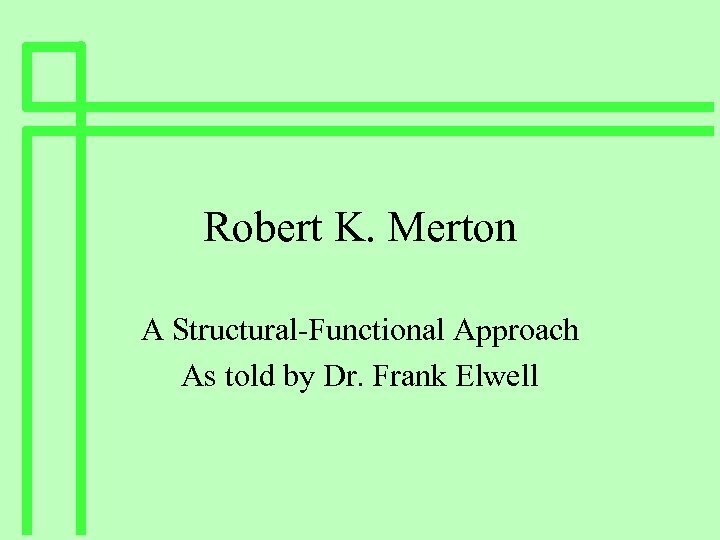 Merton, R. K. (1996). On Social Structure and Science. (P. Sztompka, Ed. ) Chicago: The University of Chicago Press. Merton, R. K. (1948/1968). Social Theory and Social Structure. New York: The Free Press.